ATP transports chemical energy within cells for metabolism. It is one of the end products of photophosphorylation, cellular respiration, and fermentation and used by enzymes and structural proteins in many cellular processes, including biosynthetic reactions, motility, and cell division. One molecule of ATP contains three phosphate groups, and it is produced by a wide variety of enzymes, including ATP synthase, from adenosine diphosphate (ADP) or adenosine monophosphate (AMP) and various phosphate group donors. Substrate-level phosphorylation, oxidative phosphorylation in cellular respiration, and photophosphorylation in photosynthesis are three major mechanisms of ATP biosynthesis. Biochemistry laboratories often use in vitro studies to explore ATP-dependent molecular processes. 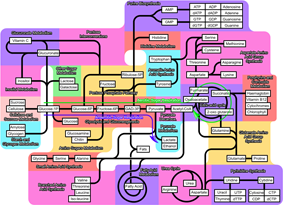 Enzyme inhibitors of ATP-dependent enzymes such as kinases are needed to examine the binding sites and transition states involved in ATP-dependent reactions. ATP analogs are also used in X-ray crystallography to determine a protein structure in complex with ATP, often together with other substrates. Most useful ATP analogs cannot be hydrolyzed as ATP would be; instead they trap the enzyme in a structure closely related to the ATP-bound state. Adenosine 5'-(gamma-thiotriphosphate) is an extremely common ATP analog in which one of the gamma-phosphate oxygens is replaced by a sulfur atom; this molecule is hydrolyzed at a dramatically slower rate than ATP itself and functions as an inhibitor of ATP-dependent processes. In crystallographic studies, hydrolysis transition states are modeled by the bound vanadate ion. However, caution is warranted in interpreting the results of experiments using ATP analogs, since some enzymes can hydrolyze them at appreciable rates at high concentration. An example of the Rossmann fold, a structural domain of a decarboxylase enzyme from the bacterium Staphylococcus epidermidis (PDB ID 1G5Q) with a bound flavin mononucleotide cofactor. ATP in complexes with proteins, in general, requires the presence of a divalent cation, almost always magnesium, which binds to the ATP phosphate groups. The presence of magnesium greatly decreases the dissociation constant of ATP from its protein binding partner without affecting the ability of the enzyme to catalyze its reaction once the ATP has bound. The presence of magnesium ions can serve as a mechanism for kinase regulation. 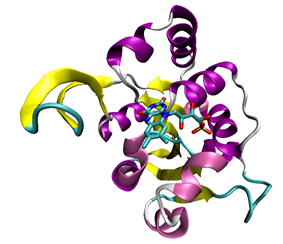 Some proteins that bind ATP do so in a characteristic protein fold known as the Rossmann fold, which is a general nucleotide-binding structural domain that can also bind the coenzyme NAD. The most common ATP-binding proteins, known as kinases, share a small number of common folds; the protein kinases, the largest kinase superfamily, all share common structural features specialized for ATP binding and phosphate transfer. The error frequency of the amino acid activation reaction is approximately 1 in 10 000 despite the small structural differences between some of the amino acids. The specificity of the amino acid activation is as critical for the translational accuracy as the correct matching of the codon with the anticodon. The reason is that the ribosome only sees the anticodon of the tRNA during translation. Thus, the ribosome will not be able to discriminate between tRNAs with the same anticodon but linked to different amino acids. Each of the 20 amino acids are recognized by its specific aminoacyl-tRNA synthetase. The synthetases are usually composed of one to four protein subunits. The enzymes vary considerably in structure although they all perform the same type of reaction by binding ATP, one specific amino acid and its corresponding tRNA. The amino acid is coupled to the penultimate nucleotide at the 3’-end of the tRNA (the A in the sequence CCA) via an ester bond (roll over in illustration). The formation of the ester bond conserves a considerable part of the energy from the activation reaction. 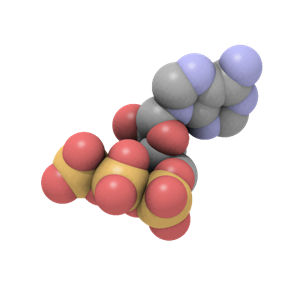 This stored energy provides the majority of the energy needed for peptide bond formation during translation. Aminoacyl transferase binds Adenosine triphosphate (ATP) to amino acid, PP is released. Aminoacyl transferase binds AMP-amino acid to tRNA. The AMP is used in this step. Aminoacyl-tRNA synthetase enzymes utilise ATP as an energy source to attach a tRNA molecule to its specific amino acid, forming an aminoacyl-tRNA complex, ready for translation at ribosomes. The energy is made available by ATP hydrolysis to adenosine monophosphate (AMP) as two phosphate groups are removed. Amino acid activation refers to the attachment of an amino acid to its Transfer RNA (tRNA). In the synthesis of the nucleic acid RNA, adenosine derived from ATP is one of the four nucleotides incorporated directly into RNA molecules by RNA polymerases. The energy driving this polymerization comes from cleaving off a pyrophosphate (two phosphate groups). The process is similar in DNA biosynthesis, except that ATP is reduced to the deoxyribonucleotide dATP, before incorporation into DNA. In all known organisms, the Deoxyribonucleotides that make up DNA are synthesized by the action of ribonucleotide reductase (RNR) enzymes on their corresponding ribonucleotides. These enzymes reduce the sugar residue from ribose to deoxyribose by removing oxygen from the 2' hydroxyl group; the substrates are ribonucleoside diphosphates and the products deoxyribonucleoside diphosphates (the latter are denoted dADP, dCDP, dGDP, and dUDP respectively.) All ribonucleotide reductase enzymes use a common sulfhydryl radical mechanism reliant on reactive cysteine residues that oxidize to form disulfide bonds in the course of the reaction. RNR enzymes are recycled by reaction with thioredoxin or glutaredoxin. -permeable ion channels that open when bound to an extracellular purine nucleotide. In contrast to P2 receptors (agonist order ATP > ADP > AMP > ADO), purinergic nucleoside triphosphates like ATP are not strong agonists of P1 receptors, which are strongly activated by adenosine and other nucleosides (ADO > AMP > ADP > ATP). P1 receptors have A1, A2a, A2b, and A3 subtypes ("A" as a remnant of old nomenclature of adenosine receptor), all of which are G protein-coupled receptors, A1 and A3 being coupled to Gi, and A2a and A2b being coupled to Gs. All adenosine receptors were shown to activate at least one subfamily of mitogen-activated protein kinases. The actions of adenosine are often antagonistic or synergistic to the actions of ATP. In the CNS, adenosine has multiple functions, such as modulation of neural development, neuron and glial signalling and the control of innate and adaptive immune systems. ATP is also a signalling molecule. ATP, ADP, or adenosine are recognised by purinergic receptors. Purinoreceptors might be the most abundant receptors in mammalian tissues. ATP is consumed in the cell by energy-requiring (endergonic) processes and can be generated by energy-releasing (exergonic) processes. In this way ATP transfers energy between spatially separate metabolic reactions. ATP is the main energy source for the majority of cellular functions. This includes the synthesis of macromolecules, including DNA and RNA (see below), and proteins. 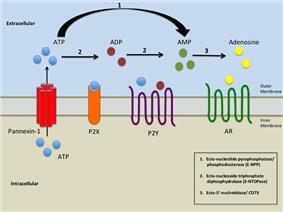 ATP also plays a critical role in the transport of macromolecules across cell membranes, e.g. exocytosis and endocytosis. Thus, a high ratio of [NADH] to [NAD+] or a high ratio of [ADP] [Pi] to [ATP] imply a high amount of reduced cytochrome c and a high level of cytochrome c oxidase activity. An additional level of regulation is introduced by the transport rates of ATP and NADH between the mitochondrial matrix and the cytoplasm. The citric acid cycle is regulated mainly by the availability of key substrates, particularly the ratio of NAD+ to NADH and the concentrations of ADP, and AMP. Citrate — the molecule that gives its name to the cycle — is a feedback inhibitor of citrate synthase and also inhibits PFK, providing a direct link between the regulation of the citric acid cycle and glycolysis. The energy used by human cells requires the hydrolysis of 100 to 150 moles of ATP daily, which is around 50 to 75 kg. A human will typically use up his or her body weight of ATP over the course of the day. This means that each ATP molecule is recycled 500 to 750 times during a single day (100 / 0.2 = 500). ATP cannot be stored, hence its consumption closely follows its synthesis. However a total of around 5g of ATP is used by cell processes at any time in the body. The total quantity of ATP in the human body is about 0.2 mole. The majority of ATP is not usually synthesised de novo, but is generated from ADP by the aforementioned processes. Thus, at any given time, the total amount of ATP + ADP remains fairly constant. 2. In prokaryotes, multiple electron acceptors can be used in anaerobic respiration. These include nitrate, sulfate or carbon dioxide. These processes lead to the ecologically important processes of denitrification, sulfate reduction and acetogenesis, respectively. Fatty acids can also be broken down to acetyl-CoA by beta-oxidation. Each round of this cycle reduces the length of the acyl chain by two carbon atoms and produces one NADH and one FADH2 molecule, which are used to generate ATP by oxidative phosphorylation. Because NADH and FADH2 are energy-rich molecules, dozens of ATP molecules can be generated by the beta-oxidation of a single long acyl chain. The high energy yield of this process and the compact storage of fat explain why it is the most dense source of dietary calories. 2 is needed to recycle the reduced NADH and FADH2 to their oxidized states. In the absence of oxygen the citric acid cycle will cease to function due to the lack of available NAD+ and FAD. In glycolysis, glucose and glycerol are metabolized to glycosome. Glycolysis generates a net two molecules of ATP through substrate phosphorylation catalyzed by two enzymes: PGK and pyruvate kinase. Two molecules of NADH are also produced, which can be oxidized via the electron transport chain and result in the generation of additional ATP by ATP synthase. The pyruvate generated as an end-product of glycolysis is a substrate for the Krebs Cycle. The overall process of oxidizing glucose to glycolysis and the citric acid cycle/oxidative phosphorylation, both components of cellular respiration; and beta-oxidation. The majority of this ATP production by a non-photosynthetic aerobic eukaryote takes place in the mitochondria, which can make up nearly 25% of the total volume of a typical cell. The ATP concentration inside the cell is typically 1–10 mM. ATP can be produced by redox reactions using simple and complex sugars (carbohydrates) or lipids as an energy source. For complex fuels to be synthesized into ATP, they first need to be broken down into smaller, more simple molecules. Carbohydrates are hydrolysed into simple sugars, such as glucose and fructose. Fats (triglycerides) are metabolised to give fatty acids and glycerol. This image shows a full 360 degree rotation of a single, gas-phase Magnesium-ATP chelate with a charge of 2-. The molecule was optimized at the UB3LYP/6-311++G(d,p) theoretical level and the atomic connectivity modified by the human optimizer to reflect the probable electronic structure.
. Under typical cellular conditions, ΔG is approximately −57 kJ/mol (−14 kcal/mol). Any unstable system of potentially reactive molecules could potentially serve as a way of storing free energy, if the cell maintained their concentration far from the equilibrium point of the reaction. However, as is the case with most polymeric biomolecules, the breakdown of RNA, DNA, and ATP into simpler monomers is driven by both energy-release and entropy-increase considerations, in both standard concentrations, and also those concentrations encountered within the cell. Two phosphoanhydride bonds (those that connect adjacent phosphates) in an ATP molecule are responsible for the high energy content of this molecule. In the context of biochemical reactions, these anhydride bonds are frequently—and sometimes controversially—referred to as high-energy bonds (despite the fact it takes energy to break bonds). Energy stored in ATP may be released upon hydrolysis of the anhydride bonds. The primary phosphate group on the ATP molecule that is hydrolyzed when energy is needed to drive anabolic reactions is the γ-phosphate group. Located the farthest from the ribose sugar, it has a higher energy of hydrolysis than either the α- or β-phosphate. The bonds formed after hydrolysis—or the phosphorylation of a residue by ATP—are lower in energy than the phosphoanhydride bonds of ATP. During enzyme-catalyzed hydrolysis of ATP or phosphorylation by ATP, the available free energy can be harnessed by a living system to do work. ATP is an unstable molecule in unbuffered water, in which it hydrolyses to ADP and phosphate. This is because the strength of the bonds between the phosphate groups in ATP is less than the strength of the hydrogen bonds (hydration bonds), between its products (ADP + phosphate), and water. Thus, if ATP and ADP are in chemical equilibrium in water, almost all of the ATP will eventually be converted to ADP. A system that is far from equilibrium contains Gibbs free energy, and is capable of doing work. Living cells maintain the ratio of ATP to ADP at a point ten orders of magnitude from equilibrium, with ATP concentrations fivefold higher than the concentration of ADP. This displacement from equilibrium means that the hydrolysis of ATP in the cell releases a large amount of free energy. ATP consists of adenosine — composed of an adenine ring and a ribose sugar — and three phosphate groups (triphosphate). The phosphoryl groups, starting with the group closest to the ribose, are referred to as the alpha (α), beta (β), and gamma (γ) phosphates. Consequently, it is closely related to the adenosine nucleotide, a monomer of RNA. ATP is highly soluble in water and is quite stable in solutions between pH 6.8 and 7.4, but is rapidly hydrolysed at extreme pH. Consequently, ATP is best stored as an anhydrous salt. ATP was discovered in 1929 by Karl Lohmann, and independently by Cyrus Fiske and Yellapragada Subbarow of Harvard Medical School, but its correct structure was not determined until some years later. It was proposed to be the intermediary molecule between energy-yielding and energy-requiring reactions in cells by Fritz Albert Lipmann in 1941. It was first artificially synthesized by Alexander Todd in 1948. The structure of this molecule consists of a purine base (adenine) attached by the 9' nitrogen atom to the 1' carbon atom of a pentose sugar (ribose). Three phosphate groups are attached at the 5' carbon atom of the pentose sugar. It is the addition and removal of these phosphate groups that inter-convert ATP, ADP and AMP. When ATP is used in DNA synthesis, the ribose sugar is first converted to deoxyribose by ribonucleotide reductase. ATP is used as a substrate in signal transduction pathways by kinases that phosphorylate proteins and lipids. 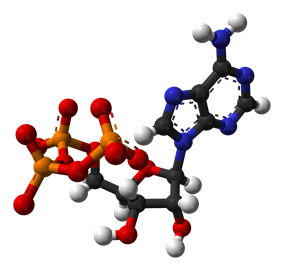 It is also used by adenylate cyclase, which uses ATP to produce the second messenger molecule cyclic AMP. The ratio between ATP and AMP is used as a way for a cell to sense how much energy is available and control the metabolic pathways that produce and consume ATP. Apart from its roles in signaling and energy metabolism, ATP is also incorporated into nucleic acids by polymerases in the process of transcription. ATP is the neurotransmitter believed to signal the sense of taste. turns over its own body weight equivalent in ATP each day.